The HD Essential Select membership provides members with access to a variety of health care programs, services and discounts to help you manage your everyday healthcare expenses, as well as consumer and lifestyle discounts and business solutions. The HD Essential Select membership also provides each Member coverage under Accident and Sickness Limited Benefit Cash Insurance. HD Essential Select Insurance benefits can help with out-of-pocket medical expenses as well as living expenses. And, these memberships are offered year round versus short enrollment periods. Whatever your circumstance, an HD Essential Select membership may be the answer you are looking for. Note: Some blackout dates and restrictions may apply. 24-hour advance reservations are required. Cord Moving and Storage Co., an agent for North American Van Lines, offers members valuable discounts on moving and relocation services while providing the highest level of service and customer satisfaction. Members receive discounted gym memberships at more than 10,000 gyms nationwide including, 24 Hour Fitness, Bally, Curves, Anytime Fitness, plus regional chains (New York Sports Clubs, etc.) and local favorites. Members can also take advantage of exclusive member savings on wearable technology, diet resources like Jenny Craig and Nutrisystem, meal plans and diet delivery options, and vitamins and supplements. *GymAmerica.com is a proprietary Web property of Genesant Technologies, Inc.
My Association Savings Benefits from Abenity provides members with exclusive perks and over $4,500 in savings on everything from pizza and the zoo, to movie tickets, oil changes, hotels, and car rentals! And, with over 102,000 available discounts across 10,000 cities in the United States and Canada, you’ll never be far from savings! • Nearby Offers: Use our show & save mobile coupons to quickly access savings on the go. • eTickets On Demand: Save up to 40% with no hidden fees. • Show times: Find movies, watch trailers, and save up to 40% at a theater near you. • Monthly Giveaways: Win cash, movie tickets, electronics and more with our monthly contests. Hewlett-Packard offers members affordable pricing on business and home office products. Members receive discounts on HP notebooks, laptops, desktops, servers, printers, digital cameras, handhelds, point-of-sale (scanners, cash registers, etc.) and more. Talk to a doctor by phone, web or mobile app anytime, anywhere. From your home, office, hotel room, or vacation campsite, simply make a phone call, and in most cases, speak to a doctor in less than 30 minutes, with an average call back time of less than 10 minutes. When you call Teladoc, you will always speak to a doctor who lives and works in the United States and is licensed to practice medicine in your state. Teladoc is also the only telemedicine provider able to treat children from 0-17¹ . It’s health care that fits in the palm of your hand. The ScriptSave Prescription Savings Card provides you access to discounted prescription drug prices. All household members can use the same card – including pets, if the pet medication is a common drug that is also used by people. There are no limits on how many times members and their family can use the card. Minors not accepted. Not available in AL, IL, OK, UT, VT, WA. The MultiPlan Limited Benefit Plan Network is a Preferred Provider Organization (PPO). A PPO is a network of health care providers who agree to provide services at a pre-negotiated rate. The MultiPlan Network is an important feature of your Health Depot membership. You have access to thousands of hospitals, practitioners and ancillary facilities who have agreed to significant discounts on their medical services. The MultiPlan Network includes nearly 4,700 hospitals, 95,000 ancillary care facilities and more than 700,000 healthcare professionals nationwide. With discounts averaging 42% for physicians and specialists—the types of services most typically used with these plans—Health Depot members get more value for their benefit dollars. Karis360’s team of Advisors offer personalized, caring, expert service helping members navigate the complex and expensive healthcare maze. With services from Healthcare Navigator to Bill Negotiator to Surgery Saver to Chaplaincy, Karis360 will sort through your healthcare needs saving you time and money. Pays a daily benefit for each day a Covered Person is Confined to a Hospital due to an Accident or Sickness. The first day of Confinement in the Hospital must occur within thirty (30) days of the Accident, causing the injury. Pays a daily benefit for each day of Confinement if an Accident or Sickness causes a Covered Person to be Confined to an Intensive Care Unit (ICU). The first day of Confinement in the Intensive Care Unit must occur within thirty (30) days of the Accident. This benefit is paid in addition to the In-Hospital Indemnity Benefit Amount. Pays the Surgical Indemnity Benefit if a Covered Person has a Major or Minor Surgical Procedure (depending on the plan level elected) performed while In-Hospital. A surgical procedure due to Accident must occur within thirty (30) days of the Accident, causing an Injury. Benefit pays if an Accident or Sickness causes the Covered Person to require and receive Emergency Medical Care in an Emergency Room of a Hospital. Treatment must be received within twenty-four (24) hours of the Accident. Benefit pays if a Covered Person requires the use of an ambulance service by ground for transportation to or from a Hospital or from one Hospital to another Hospital for care and treatment of a covered Accident or Sickness. Benefit pays if a Covered Person requires the use of an ambulance service by air for transportation to or from a Hospital or from one Hospital to another Hospital for care and treatment of a covered Accident or Sickness. Benefit pays for a Covered Person’s Physician Office or Clinic Visit due to an Accident or Sickness. The visit must occur within thirty (30) days of the Accident, causing an injury. This benefit is not payable for routine eye exams, dental exams (unless the result of an accident), or annual physical exams. Pays the Surgical Indemnity Benefit if a Covered Person has a Major or Minor Surgical Procedure (depending on the plan level elected) performed on an outpatient basis in an Outpatient Unit. A surgical procedure due to Accident must occur within thirty (30) days of the Accident, causing an Injury. Benefit pays if a Covered Person has diagnostic x-ray and laboratory tests related to an Accident or Sickness. The tests must be ordered by a Physician and performed on an outpatient basis. Preventive tests are payable under the Wellness Indemnity Benefit and not payable under this Benefit. Tests performed due to an Accident must be done within thirty (30) of the Accident causing Injury. Benefit pays if a Covered Person has one of the following tests performed on an outpatient basis: Angiogram /Arteriogram, EEG, Myelogram, CT Scan, MRI Scan, or PET Scan. The tests must be ordered by a Physician and be related to an Accident or Sickness. This benefit does not pay for tests performed while Confined in a Hospital. Benefit pays if an Insured Person or his/her Spouse or Domestic Partner has one of the following screening tests: Stress test on a bicycle or treadmill; Fasting blood glucose test; Blood test for triglycerides; Serum cholesterol test to determine level of HDL and LDL; Bone marrow testing; Breast ultrasound; CA 15-3 (cancer antigen 15-3 - blood test for breast cancer); CA125 (cancer antigen 125 - blood test for ovarian cancer); CEA (carcinoembryonic antigen - blood test for colon cancer); Chest X-ray; Colonoscopy; Flexible sigmoidoscopy; Hemoccult stool analysis; Mammography; Pap smear; PSA (blood test for prostate cancer); Serum Protein Electrophoresis (blood test for myeloma); Thermography; ThinPrep Pap Test; Virtual Colonoscopy. This benefit is payable once per Plan Year per Insured Person or the Insured Person’s covered Spouse or Domestic Partner. If the benefit is payable under the Diagnostic X-Ray and Laboratory Indemnity Benefit or the Surgical Indemnity Benefits as it relates to an Accident or Sickness, it will be paid under that benefit and not this Wellness Indemnity Benefit. * Wellness Indemnity Benefit does not cover Dependent Children. Wellness Indemnity Benefit is not available in CA and OH. One-time $99 enrollment fee applies, charged by Health Depot Association. Chubb is the world’s largest publicly traded property and casualty insurer. With operations in 54 countries, Chubb provides commercial and personal property and casualty insurance, personal accident and supplemental health insurance, reinsurance and life insurance to a diverse group of clients. Insurance products and services are provided by Chubb Insurance underwriting companies and not by the parent company itself. Federal Insurance Company has a 2017 AM Best rating of A++ (Superior). This rating is an indication of the company’s financial strength and ability to meet obligations to its insureds. Insurance benefits are not available to residents of: AK, CO, CT, HI, ID, KS, LA, ME, MD, MA, MN, MO, MT, NV, NH, NJ, NY, NC, OR, SD, UT, VT, WA, WV. *Wellness Benefit is not available in CA and OH. Not available in AK, OK, UT, VT, WA. 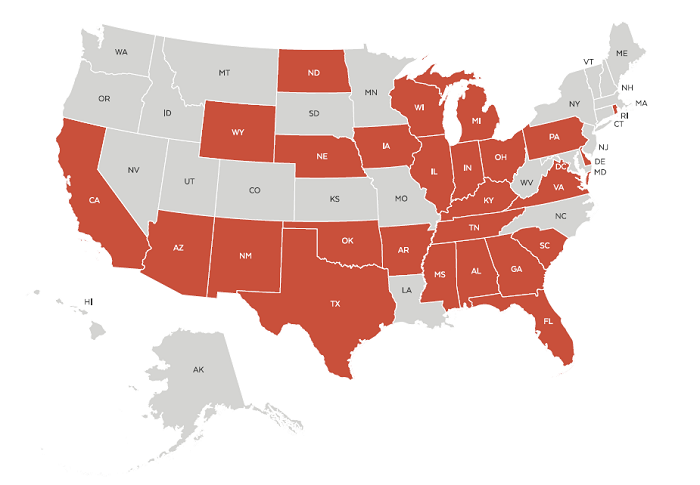 If you move to one of those states, your discount medical benefits will terminate. The discount medical, health, and drug benefits of this Plan (The Plan) are NOT insurance, a health insurance policy, a Medicare Prescription Drug Plan or a qualified health plan under the Affordable Care Act. The Plan provides discounts for certain medical services, pharmaceutical supplies, prescription drugs or medical equipment and supplies offered by providers who have agreed to participate in The Plan. The range of discounts for medical, pharmacy or ancillary services offered under The Plan will vary depending on the type of provider and products or services received. The Plan does not make and is prohibited from making members' payments to providers for products or services received under The Plan. The Plan member is required and obligated to pay for all discounted prescription drugs, medical and pharmaceutical supplies, services and equipment received under The Plan, but will receive a discount on certain identified medical, pharmaceutical supplies, prescription drugs, medical equipment and supplies from providers in The Plan. You may call (855) 351-7535 for more information or visit members.healthdepotassociation.com for a list of providers. The Plan will make available before purchase and upon request, a list of program providers and the providers’ city, state and specialty, located in the member’s service area. The fees for The Plan are specified in the membership agreement. Note to MA consumers: The discount plan is not insurance coverage and does not meet the minimum creditable coverage requirements under M.G.L. c. 111M and 956 CMR 5.00. Please fill in information below and a representative will be in touch.